I remember when Labor and the Coalition both pledged to build Southland station. It was 2010. I told my kids, who were excited. They were 15 and 12 at the time, just the ages when they were looking forward to exploring the city and suburbs on their own, going to places like Southland with friends. Of course it was the Coalition who won the 2010 election. In 2012 I looked back at progress — at the time, not much. By 2013 a little bit of detail of the plans had emerged — for a basic station. No matter, said I — the fancy amenity can all come later. The important thing is just to get it built. Toilets? Not that important. There are some in the centre on the ground floor, about 150 metres (or one train length) away. Bus interchange? Not that important — almost all the bus routes that serve Southland already intersect the Frankston line at other stations. In fact given that one could reasonably expect Westfield to expand the centre towards, up to and perhaps over the railway station once it’s clear it’s bringing more punters, much of any facilities provided would be likely to be replaced anyway. Even with the bare-bones design, it took until 2014 for full funding to be provided in the state budget, with expected opening in 2016. When I quizzed her about it last year, then-MP for Bentleigh Elizabeth Miller told me that construction would start in early 2015. At that point, the only progress had been a few banners unfurled at the site. This week she noted that she had been the MP when the funding came through. Yes well, that’s good, but perhaps if that had happened in 2012 instead of 2014, and the station completed before the 2014 election, she might have held onto her seat. Nearby Carrum, Mordialloc and Frankston might have also stayed with the Coalition. The problem was, between 2012 and 2014, the Coalition was so fixated on the East West Link that they dropped the ball on even relatively cheap public transport promises like this. Such as contrast. The news this week is that PTV is running consultation sessions (19th March 5:30-8:30pm, Cheltenham Community Centre and 21st March 9am-2pm at Southland) — and that toilets are back in scope. They’re also wanting to know community views on an entrance via Tulip Grove, on the other side of the railway line. It seems someone at PTV had their wits about them when they spotted a property in the street had come up for sale, and bought it, to be used for construction — no compulsory acquisition required. I think it’d be good to provide permanent station access as well, with parking restrictions in the street to prevent shoppers parking there — but it makes sense to ask the locals what they think. But they’re now saying the station is expected to open in 2017. By that time Southland Station is built, my kids will be 22 and 19, both old enough to drive — though at current trajectories of interest, I’m not assuming that they will be driving. That’s another story of course, but fundamentally if we’re hoping fewer people drive in the future, they will need other, viable options to get around. With appalling bus services and very inconvenient train access, it’s hardly surprising that Southland remains so car-dependent, and it’s a battle every weekend to find a spot to park. The sooner the station opens the better. PS: I understand the station is not planned to be Premium (fulltime staffed), despite the presence of public toilets. This is likely to be the first of this type of station, and will probably mean an Exeloo-type installation. Additionally Hallam station, also not Premium, was the subject of an election promise for toilets, so is likely to get an Exeloo. Presumably this type of automated self-cleaning toilet is an option for other stations as well, both staffed and unstaffed. Update 8/3/2015: Comments from some local residents have prompted me to dig out a site plan I came across last year. It’s from 2013, so may have been revised, but hopefully is indicative of the current plan. No doubt we’ll hear more at the consultation sessions. It’s hard to see here — click here to see it bigger. Update 11/3/2015: PTV has published more details, and plans and artist impressions on their web site. As per the comments, the plan has changed a bit from the above diagram, with the platforms moved further south along the line. It’s worth noting that the intent is not to reposition the tracks. This is apparently difficult/expensive due to the nearby bridge over Bay Road. This rules out an island platform for the station. Purchasing the house on Tulip Grove was an incredibly clever idea – despite what people like to say about PTV being incompetent, there do have plenty of good people – they just get stymied by bureaucracy and a lack of funding. yes, it seems incredible that something like this can take so long. And not one sod has been turned over yet. Great news if the station will now in fact be built. The neighbouring property purchase is an excellent move, straight out of the VicRoads handbook on how to be successful at managing infrastructure. Sadly I have a feeling that it wasn’t a “top man” within PTV or the government that came up with the idea; but perhaps smart and progressive less-senior staff will shape the public service into a usable and nimble beast. I can hope. Also Southland station doesn’t need anything other than platforms, ramps and lights (plus minor amenities). The users won’t care, the public won’t care, but if it isn’t ticked off on a press release, goddamn it will get bad press (and then people will care enough to complain). The flipside is do it right the first time because it might not be modified for 30 years. I wonder if they will leave space for a third track? I wonder if that is still on the minds of anybody within the public service? The delay is bad but having loos will be good. All non-premium stations should have been given Exeloo-type insulations when the staff went but it is still a worthwhile project. They are even better than the standard of many premium station`s loos, only the city loop and recently renovated stations have better loos. The Tulip Grove purchase is excellent. I hope it is easy to integrate with the underpass and station entrances. In order for the entrance to have the best pedshed, a walkway should be constructed between Crocus Court and Luxmore St.
Who actually made the arguments against the station. This is why we cannot progress on PT investment. This is not the only case, I remember the Melbourne Metro and the reason it couldn’t be built is that it would be like the Berlin Wall by Dennis Napthine. Due to the change of government everything will be pushed back 12 months at least. I did website migration at DTPLI and got to look at the Department of Transport website I had already worked on in 2012. I also managed to look at some of the older stuff including planning documents that showed some transport planning takes decades to come to fruition. The Box Hill train station constructed the 1980’s could be a model of how the Southland design could look optimally. It could use the same concept with the station and shopping center integrated. I’m sorry but the proposed location is not a Southlands station the trains will have barely left Cheltenham before they need to stop. There is no impact to Westfield (doesn’t affect their parking etc) but there is huge impact to residents who have had absolutely no consultation on this project until now as the plans are going public. The underhanded purchase of one house in the street just make this impact even greater. Anyone that knows Tulip Grove will know that providing access in this street is simply out of the question – there is no parking and no ability to handle increased traffic in a no-through road location. This whole thing has been handled in a disgraceful manner. @Concerned Resident, that’s not really correct. The station site is directly next to the carpark, making it about 1.1km from Cheltenham, and 1.2km from Highett. 1km spacing of stations is common in many sections of Melbourne’s rail lines, and is actually farther apart than stations in the Ormond to Moorabbin section of the Frankston line. That said, you’re correct that — from what I’ve heard — the station footprint won’t impact on Westfield’s land. Nobody should be suggesting Tulip Grove should provide vehicle access to the station. Whether or not the property is left opened up as a pedestrian entrance to the station, the council should look at parking restrictions (either time-based or resident/permit only) to ensure nobody gets the idea they can park there to access Southland or to catch a train. I’d strongly suggest you and other residents go to one of the consultation sessions. Public Transport Victoria will run consultation sessions on March 19 at Cheltenham Community Centre from 5.30pm to 8.30pm and March 21 from 9am to 2pm in Southland shopping centre. According to my Google maps calculation Bay Road Bridge is half way between Highett and Cheltenham Stations at approx 1.16km. For some inexplicable reason the Southland proposed Station is located from 1.36km extending to beyond 1.54km toward Cheltenham. That is not 1km spacing!! Only a small portion of the proposed station directly faces Westfield land, is remote from Bay Road, and most of it backs onto residential property. It even comes within a few metres of the living rooms of a number of Tulip Grove residents. Why? With the proposed exit onto Tulip Grove this is fast becoming a Tulip Grove Station because its not impacting Southland. Entry and parking is already a problem in Tulip Grove as it is a no through road. This exit proposal will increase traffic, pick ups, drop offs, pedestrians, shopping trolleys and litter to name a few negatives. Tulip Grove already has pedestrian access to Bay Road so why not build the station there at the half way point. Hi Daniel, I’m not sure if you’ve seen the plans but the current proposal is not directly next to the majority of the carpark and I think may members of the public will be surprised at just how close to Cheltenham station the southern end of the platforms are. On top of this while this station is being promoted as providing access to Southlands it will be fully operational outside of trading hours which makes no sense. The consultation with affected residents has been non-existent despite many of us calling & using the “online enquiry form”. The plan in it’s current state offers no real security, privacy or soundproofing consideration for affected residents and with trains having to go so slow through this area given the proximity of stations this extends beyond those directly on the platforms. I’m sure Westfield has been consulted vigorously throughout this whole process so surely anyone affected should have been given the same courtesy and opportunity to voice their perspective prior to finding out in a public meeting. Whether this plan actually meets the publics needs given the proposed distance is yet to be seen but regardless consideration of security, privacy & general impact on quality of life should be given to residents up front rather than something they need to fight for. I challenge anyone to come into my backyard and honestly tell me the plan in its current state provides anything but a detrimental affect on my family. 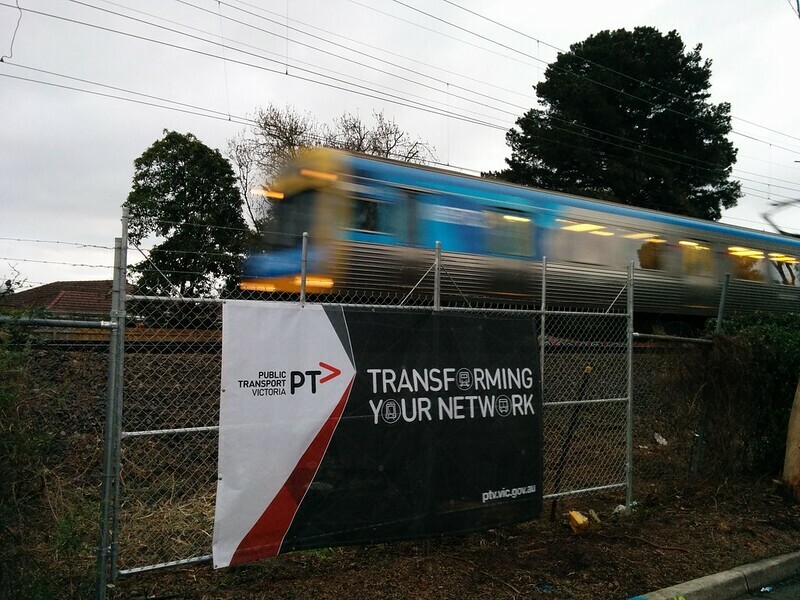 I doubt the PTV ladies that came to share the plans would be able to put a positive spin on it. It has been pointed out to me on social media that I live on a train line so what did I expect. I expected the 10 seconds of high speed train every 20minutes that I had full knowledge of. I did not expect a year of heavy construction, the disruption to my family, the potential health implications of that construction, and then lights, PA systems, drunk people & people trying to climb my fence 24 x 7. I did not expect slow trains & a platform outside my fence providing full visibility into my backyard and through my house due to the height of the line. And I definitely not expect for all of this to be decided by someone without any discussion, no review of my property and no thought as to the impact. As to your point about acquiring one house I (and many of my neighbours) also would have jumped at the chance if it had’ve been given. I’ve added the most recent plan I have, which was current last year, though it was drawn up in 2013. Perhaps things have changed, but it shows the station entirely adjacent to Southland, with only an 80 metre reservation (for future platform extension, if extra-long trains ever happen) extending further south. It’s worth pointing out that the station will have PSOs on duty from 6pm to last train, so your fears of drunks and people climbing the fence (which according to the plans will be 2 metres high, so only giants will be able to see over into your garden) may be allayed, at least after 6pm. Train operating hours would match the rest of the line, yes. Bear in mind the cinemas and supermarkets at Southland are open until late, and dare I say local residents may be able to make use of the station for some of their travel needs too? I take your point on the lack of consultation. Hopefully the sessions to occur will help a bit with that. It’s a reminder that no matter how logical a project, they really need to communicate and consult properly with the locals. OK thanks. This will obviously be something to watch with interest. Thought: Have they been lazy and re-aligned the station so the entrance (at the northern end of the platforms) is lined up with the purchased property, eg moved the whole thing further south? Yip – that’s exactly what they’ve done. I always wondered about the residential side of this development and station. Obviously there is plenty of room on the Westfield side but things look pretty tight on the Tulip Grove side. Personally I live right next to the Lilydale/Belgrave/Alamein lines, I can see Hawthorn Station Platforms and all three tracks from my window as I type this. I get numerous express trains during the week and at the weekend trains stopping every ten minutes between 10AM and 7PM. Granted, I chose to live here knowing full well what I was getting myself into, and there isn’t a day when I’m sorry for the decision. I’ve lived here for 13 years now, and for the last 8 I haven’t had a car. 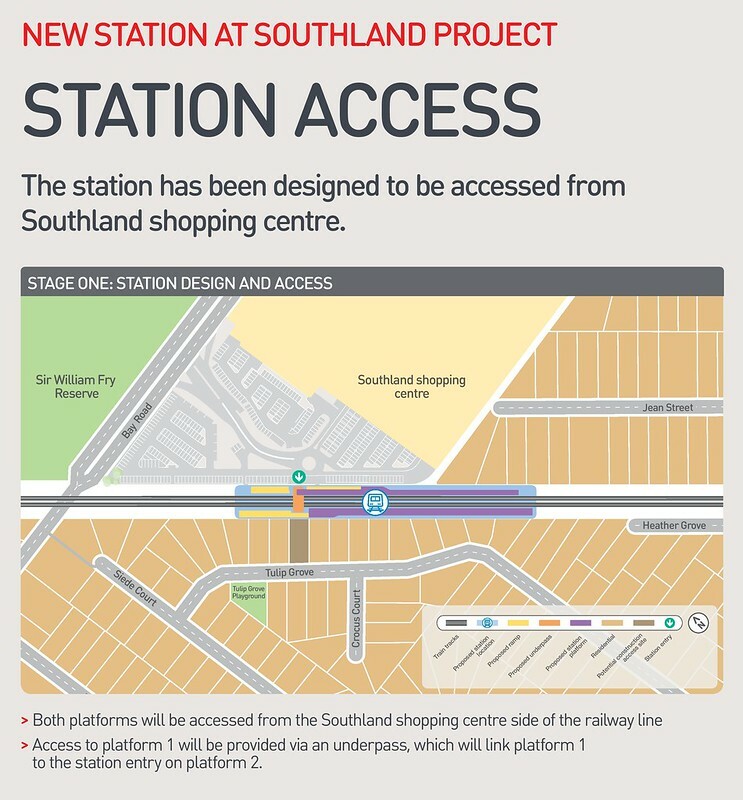 Obviously living so close to a railway station isn’t going to be great for everyone, but Surely this station will help just as many of the locals as it will help people like me who are more likely to visit Southland because it’s now easier to get to. @Nathan – I agree I like living so close to Cheltenham station and my express commute to the city for work. But I have huge concerns over the handling of this project, community consultation & that the actual proposal even delivers on what is being asked for. The major financial beneficiary (Westfield) is the only party that has been consulted and what appears to work for them & PTV makes it even more detrimental for the residents. Strangely these concerned residents forget about the impact of all those extra cars that use Southland shopping centre because it is currently not served by a railway station. This will actually help take cars off the road which results in less traffic and fewer parking issues. Removing access to Tulip Gve would discourage local residents from using the station meaning more traffic and more cars requiring parking. Car dependency has far worse implications on health and pollution than one year worth of construction. In terms of drunk jumping your fence this is total scaremongering I’ve never heard of other stations near residential areas having the same problem. We have always expected a station at Southland and can see the value of it. Last week we were shown plans which bear no resemblance to the plans previously proposed. We were shocked/surprised to find that the station will not be built in front of Westfield’s carpark, but into Cheltenham residential area with the end of the platform only 800 metres from Cheltenham Station. Three houses towards the end of this platform are built within a few metres of their back fence. Yes Daniel. It looks like the cheap and lazy option because it is more expensive to build a station closer to Bay Road. Having just read the comments from ‘Concerned’. Hope this shall not be another PTV stuff up with it being located too far away from the shopping center to be any good. Any improvement in public transport facilities will have an impact on residents but the key fact is that this station will serve a major shopping centre and as a result will lead to an increase in public transport patronage. This is why the benefits of building the station will far outweigh the costs. In the case of Tulip Gve you would probably see an increase in pedestrian movements but an overall decrease in car movements because the increased station density will mean fewer people need to drive to the station. IE more people will walk to Southland station rather than driving to Cheltenham station as many more residents are within walking distance of the rail network. As the station lacks a commuter car park on the western I doubt that there would be many extra car movements because the station is designed to serve Southland it is not really a commuter station although since it is in close proximity to a residential area there is no reason why it can’t serve the area and in fact would be very wasteful if it didn’t have access from the residential side. I am not sure about the impact of lighting if that was a real problem you would lobby to get the streetlight turned off in your street. As it is a minor station I don’t think there will be many PA announcements except for occasional disruptions and a visual display would be more than adequate to notify trains patrons of oncoming trains. Extra pedestrian movements actually lead to a decrease in crime not the other way around so I don’t see why extra people walking on a footpath are a major problem in fact they increase the vibrancy of the street and passive surveillance. Yes their could be littering and rogue trolleys although this could be a problem anywhere in Melbourne and easily solved by GPS on trolleys and ample placement of bins . Additionally if you do not like the presence of people it is probably better to move to a rural location where there are fewer humans around. You cannot expect to live in large city close to a major shopping centre and a very busy rail corridor and expect no activity or construction in the area. In fact investing in public transport instead of roads will significantly lower the impact of our transport movements due to less overall noise, pollution, congestion and a major boost to our economic productivity. Additionally you state that your health will be impacted, I don’t see how there is any logic to this as there is plenty of construction going on around Melbourne and it usually does not result in peoples health being impacted. The opposite is true as our lack public transport investment has resulted in increased obesity, pollution and accidents. This is significantly worse for health than the construction of a small station for a year. I wouldn’t be quite so quick to dismiss concerns around sound and light. Station lighting is much brighter than street lighting – I’ll see if I can find a photo that illustrates it. Sound from automated announcements and train horns (which one would expect would increase given presence of a station) can also be quite loud, though having lived next to a rail line in the past, people usually get used to them pretty quickly. These types of problems can be mitigated or eliminated with care, but that’s the type of detail that isn’t yet clear, and residents should rightly be asking PTV about it. I apologise for the aggressive tone in the previous comment however the greater benefits must be considered here and of course there are costs versus benefits and in this regard the benefits greatly outweigh the costs. The construction of a station in this area will have amenity impacts and I agree that the lighting and sound can affect residents. The mitigation should be taken into consideration and it would not be unreasonable to request that Westfield fund some of these measures as they will gain extra revenue from the station. In regards to honking horns this is more frequent on level crossings for safety and as Bay road does not have a level crossing the trains will rarely honk their horns in that area. And in addition the noise made by trains is considerably less than private cars if you factor in the noise of 600-800 cars versus the noise of 1 train (comparative capacity). I can understand that public consultation is important although the concerns need to be reasonable and weighed against the benefits or else the state government will not make the necessary investments to allow public transport to gain a greater share from private cars. The same issue was highlighted in a northern council were residents complained against car sharing spaces because they were potentially losing their private car space to the car sharing company. The council in a diplomatic tone played down their concerns because the loss of that one space could effectively remove the need for up to 10 other car spaces. So in this case the greater good for the environment and social equity outweighed the needs of a vocal minority. I’m not saying this station shouldn’t proceed if it’s deemed it meets the greater publics needs then fine. I currently use the trains and think it’s a great service but as someone who will now need to live with this 24/7 & be directly impacted unlike Westfield or the wider community I believe we should have had more consultation. No one has come into our property until they came last week to show us the plans. No one has assessed how close this will be, how the PA’s & lights will impact. No one has discussed how to minimise sound pollution. No one has provided us with information into the soil samples they have taken to alleviate our concerns over the health of our families. With the platform being built 1 meter away from our fence where our 1 year old & 3 year old play why is it unreasonable to expect this? With train windows above our fence line why can’t we ask how our privacy concerns will be addressed? With proposals to run trains 24 hours in weekends from 2017 when this station will open why can’t we be concerned about who will be literally on our fence at all hours of the day & night and the noise/security around this. We are basically getting the same opportunity as the wider public who we know will be more positive and put our concerns down like I have faced on this forum. I don’t believe anyone should just have to shut up and accept the long term implications that our neighbourhood is facing without proper information and consultation. Interesting that they’re putting in an underpass. They’ve been removing underpasses elsewhere! According to the plans they have addressed the issues with lighting, security and privacy. I would be more concerned about health issues from cars than trains. It is close but so is the road in front of your house and that is statistically 100 times more dangerous to your 1 and 3 year olds from driveway accidents from cars than the train itself. Interestingly you have bought a property that does back onto the train line so you probably should have chosen to buy a house further from the railway line and most people will actually benefit from the station as it will reduce car movements and increase safety not reduce it. So you will actually benefit more from the station being there than you will be impacted, especially as those impacts have been mitigated. Interesting that the only access to the station will be from private land – General Motors was the only other example that I can think of, and I don’t think that was open to the public. @Concerned Resident. The station will get built – it would be too politically embarrassing not to build it. Forget about whether you think you should have had more consultation – there is nothing they can do to fix that now, and complaining about it will just obscure issues they can fix. – better pedestrian catchment from the side streets off Bay Rd west. You would then have a separate entrance at the south end for Southlands. Now that most stations are barrier-free, there’s no reason why you can’t have multiple access points as convenient. Is the issue that the earthworks for a northerly site would cost a few shillings more? So we get a permanently inferior outcome in order to save some minute percentage of project costs. Classic spoiling the ship for a haporth of tar (like the decision not the give the Regional Rail Link a station at North Melbourne; like the earlier decision not to give the Regional Fast Rail project gauge-convertible sleepers to Ballarat and Bendigo). 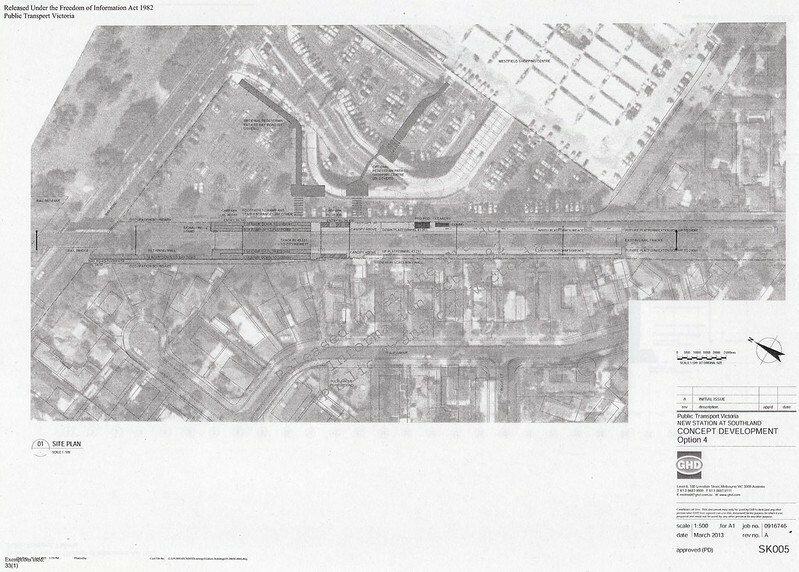 How will the proposed station entrance relate to Southlands, anyway? The PTV plans have no information on this. The proposed entrance seems to debouche onto a ghastly wasteland of carparks and blank walls – the worst pedestrian environment imaginable. There will be a serious need for some work on the Southlands property to create acceptable pedestrian links – without that, the whole project might be a white elephant. It would appear that the only real possibility for a reasonable pedestrian walkway is along the south boundary of the property. I believe there are enormous benefits in having a Station that is in walking distance of, and accessible from, Tulip Grove and accompanying Streets. I currently walk home from Cheltenham Station down Park Road and Tulip Grove after dark and I really have to keep alert as there are no people walking in the street. Having a well lit exit to Tulip Grove and having some people walking on the street with me would make me feel much safer. If the walkway through Tulip Grove from the proposed station does not go ahead, the current alternative to accessing the proposed Station from the nearby streets is the Bay Road laneway. This laneway is dark and isolated and to be avoided after dusk. Further the path on Bay Rd does not offer pedestrians any safety barrier from the traffic along Bay Rd. On a separate but related matter I don’t believe that parking will be a greater problem than what it is now and good luck to commuters in finding available car parking in Tulip Grove. Currently, I find it difficult to access and depart my Tulip Grove property due to cars being parked 24/7 either side of my driveway and across the street. I believe this is due to higher density dwellings that have and are being built in Tulip Grove. For example look at the 3 double story apartments being built in Tulip Grove about opposite to the proposed station access site. It is unclear to me where the residents of these apartments will park. There are also a number of no standing zones already in the street which reduces the availability of parking. I am interested in hearing and understanding the views of Tulip Grove being clogged up and that people will drive down Tulip Grove to drop commuters off at the Station. The main way to access Tulip Grove is from Park Road. I would have thought it would be simpler and quicker if you were going to a station that you would continue to drive down Park Road and drop off at Cheltenham Station? I am trying to figure out where and from what direction you would be driving from that would make parking and dropping off in Tulip Grove, more attractive than continuing to Cheltenham and I can’t come up with an answer. With the potential parking problem that some people are envisaging, couldn’t this be fixed with 1) resident’s parking; 2) restricted time zones; 3) Local traffic only signage to access Tulip Grove? I think the point about Kiss And Ride is a good one. It seems unlikely that anybody would use Tulip Grove to drop someone off – for most people it’d be far easier to drive via Bay Road or Nepean Highway and drop someone in the Southland carpark (or indeed at Cheltenham) than venture into the maze of side streets and have to turn around and figure out a way back. I have just recently bought a property in the Cheltlenham pocket near Bay rd on bay side. I am very excited to be having a new station built that will be within 400m from our new house! My question is will the new SL station become the express stopping station instead of Cheltlenham? To me that would make sense as one would think that the new SL station would become a main station. Similar to @Simon’s comment – Daniel what do you think – would Southland station have express services running from it and become a major train station in the near future? or given it’s not being flagged as a Premium station that would not happen? Good question. I don’t know what the plan is, but I note that the third track ends at Moorabbin, and so do some of the morning peak-hour stopping trains. If expresses don’t stop there, then like Highett, Southland will have a reduced service compared to most other stations on the line. The status of Premium doesn’t really come into it. The original Premium stations were based on operational necessity of having staff at those locations, not the number of passengers and trains (though many recent Premium stations have been based on other factors). I have heard on the grapevine that the EOIs for the design and construct process are well outside expectations, and the project budget now looks inadequate. Given that the election commitment around grade-separation is clearly a higher priority, and even that is currently unfunded, we may be looking at a further deferral of the station, or a reversion to something extremely basic. For a lot of local residents the real concern is that Bayside City Council has pre-empted the whole process by targeting areas of Cheltenham and Highett within 800m of the proposed station for so-called ‘medium density’ redevelopment. There is one proposal already for 17 apartments up to 3 storeys on one house block in Tulip Gve – sounds like high density to me! Local streets can’t cope with current traffic and all feed into Park Rd (which gets clogged with overflow parking from Cheltenham station and gridlocked when the gates are down during peak hours) or Bay Rd (which is clogged much of the day already). When you look at what happened around South Yarra you’d have to ask whether planning has any hope of actually controlling things once they get going. How about a moratorium on increased density development at least until the station is built? We need public transport to be a solution to traffic problems, not a cause of their exacerbation. Second half of 2016 and no sign of the station. Earlier this year, the whole track section where the station will be built was levelled and laid with new track, sleepers, and drainage. New signal cable trays have been installed, and signal changes made in readiness for a station. All that’s left is to announce who’s won the contract to build the station, and get on with it. So far, no one officially or unofficially has provided any good reason for the delay. My gripe is not with this particular station but with all crossings, theres no need for the bells to be so loud it must be so annoying for the people living close, theres already boom gates and flashing lights. We don’t have bells on traffic lights, they are not necessary. If the bells are for pedestrians, they don’t need to be heard from a block away. My house is not near a crossing in case you think thats why Im complaining but I empathise with the residence that do live close.